Wide Selection of M12 Extension Cables Available. Our PR-25AP RTD Air Probe combines the availability of the high accuracy sensor options found in our Ultra-Precise RTD probes with the convenience and reliability of our M12 enabled PR-21 probes. The PR-25AP offers RTD accuracies of Class A, AA (formerly 1/3DIN) and 1/10DIN sensing elements with the ease and reliability of the M12 connection. 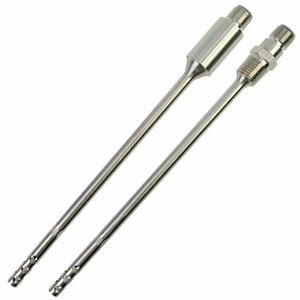 Installed directly into your product or process using an NPT threaded port. The non-threaded design can be combined with our M12-Handle accessory to convert it for hand-held sensing applications. The PR-25AP, like all of our M12 enabled probes, comes standard with a 4-wire, 4-pin, M12 A-Coded plug connector for easy assembly to extension cables. This allows it to be used in any 2, 3 or 4-wire measurement system for maximum flexibility. For 1/10DIN accuracy we highly recommend using a 4-wire measurement to take maximum advantage of the tight accuracy option. When ordering your PR-25AP sensor, don't forget your extension cable. Omega offers a wide selection of extension cables including over molded PVC, Polyurethane and Silicone cables, as well as customized cables in a variety of materials with optional stainless steel braid or hose for improved mechanical protection, and a wide selection of instrument connections. Connect your PR-25AP RTD sensor to one or more of Omega's wide variety of in-stock controllers, data loggers, transmitters, hand held thermometers, PLCs, or other measurement & control products to complete your measurement or control system. Omega offers a selection of programmable and fixed range transmitters that can be connected directly to the M12 connection of your PR-25AP sensor. There are also wireless transmitter options available. Nota: For 1/3 DIN accuracy, change “-A-” to “-1/3-” after the “-25AP-” in the model number and add $9 to price. For 1/10 DIN accuracy, change “-A-” to “-1/10-” after the “-25AP-” in the model; number and add $36.50 to price. A limited selection of Pt1000 elements are available, please consult sales.